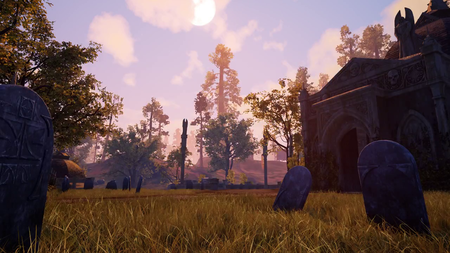 Ashes of Creation intends to use traditional loot rules, selected by the party leader. A master looter (or lootmaster) is a player designated by the party leader to decide how loot is distributed in a dungeon or raid party. With round-robin looting, party members take turns looting. This is a traditional need before greed system based on dice rolls. Intrepid are investigating a potential bidding system, which allows players to bid on items instead of rolling for them. The gold then goes into a pool that is split among the rest of the party members. AoE (Area of effect) looting is not included in the looting mechanics at the time of writing. It may be added based on feedback. Resources will have differing levels of quality for the same resource type. This is somewhat similar to Star Wars Galaxies. Gatherers who are more advanced in their artisan tree will have a greater chance of collecting higher quality resources. Mounts and pets are dropped by world bosses on a very rare basis. Temporary mounts that drop from bosses will age and eventually die. Crafted items will be on par with best in slot items. Highest tier items will be a combo of both crafted and boss dropped. The rarity of the items will be commensurate with the effort required to gather, process and craft the items. It may be possible for crafters to determine what their crafted items will look like. At the moment, harnessing corruption to warp items into demonic or decayed things in not on the cards. A crafter's name is embedded in the items they craft. We believe that every item that exists in the world should in some way reflect its creator. As such, there will be extreme versatility in our crafting system – giving crafters the ability to create unique items that represent their strengths and weaknesses. Gatherers may have the ability to "spoil" a boss' loot. The dynamics of who has the authority to gather the loot will be decided based on testing. The loot tagging system is still being finalized. 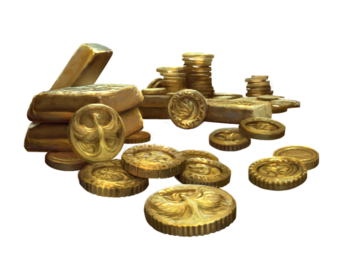 In-game currency is referred to as "gold". This may be a placeholder name. Game currency does not have weight. In-game rendering of dropped items (such as Gear and Currency) is not a planned feature. ↑ 1.0 1.1 Group dynamics blog. ↑ Livestream, 15 May 2017 (48:30). ↑ 3.0 3.1 3.2 Livestream, 24 May 2017 (44:14). ↑ 5.0 5.1 February 8, 2019 - Questions and Answers. ↑ 7.0 7.1 Interview, 20 October 2018 (2:13). ↑ Livestream, 5 May 2017 (14:45). ↑ Livestream, 24 May 2017 (24:19). ↑ 16.0 16.1 16.2 16.3 16.4 Podcast, 4 August 2018 (1:44:54). ↑ 20.0 20.1 Livestream, 15 May 2017 (45:20). ↑ 26.0 26.1 26.2 26.3 26.4 26.5 26.6 26.7 Podcast, 5 May 2017 (43:05). ↑ Livestream, 26 May 2017 (54:00). ↑ Livestream, 24 May 2017 (13:19).